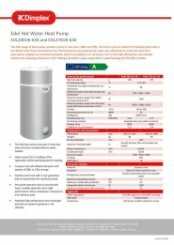 The Edel range of heat pump cylinders comes in two sizes, 200L and 270L. The inner vessel is made from stainless steel with a hot water heat pump mounted on top. 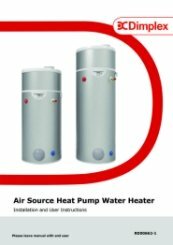 The heat pump can produce hot water very efficiently as it extracts heat from external air supplied via insulated ductwork, which is available as an accessory. Stainless steel tank with 5 year guarantee and no requirement for sacrificial anode. Specified with insulated ducting to minimise installation time and look smart. High COP of 3.43 according to EN16147 giving high carbon savings, and maximum potential savings in SAP or RdSAP over competitive systems. 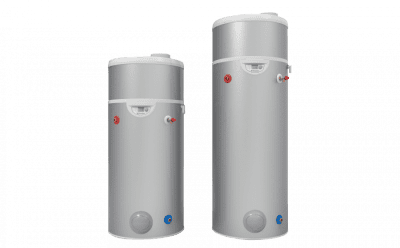 Compact unit with 630mm diameter with options of 200L or 270L storage. Low height allows installation in a standard apartment with adaptable ducting to cope with a variety of situations. Very quiet operation due to sound proof hood, variable speed fan and a high performance rotary compressor mounted on anti-vibration pads.